Home National Security Terrorism Is India Under Weaponized Biological Attack? हिंदी में पढ़ें: क्या भारत बायोलाजिकल वारफेयर हमले के तहत है? Although Bill Gates didn’t provide much contextual information, a month ago similar warning was voiced from London by the Thomson Reuters Foundation with specific details. The greatest fear is that a deadly strain of avian flu could then mutate into a pandemic form that can be passed easily between people – something that has not yet been seen. Avian influenza A(H7N9) is a subtype of influenza viruses that have been detected in birds in the past. This particular A(H7N9) virus had not previously been seen in either animals or people until it was found in March 2013 in China. In China, H7N9 strains of bird flu have been infecting both birds and people, with the number of human cases rising in recent weeks. According to the WHO, more than 900 people have been infected with H7N9 bird flu since it emerged in early 2013. Nearly 40 countries have reported new outbreaks of highly pathogenic avian influenza in poultry or wild birds since November, according to the WHO. Few weeks back animal quarantine authorities in Taiwan have slaughtered at least 150,000 poultry after an outbreak of the bird flu was found in many counties and cities across the island. In the UK, after the Department for Environment, Food and Rural Affairs (Defra) detected the H5N8 strain the authorities confirmed to have culled 23,000 chickens. The disease is reported to have reached Ireland. Spain’s Central Veterinarian Laboratory in Algete, in the outskirts of Madrid reported a case of the highly contagious H5N8 bird flu virus in a northeastern farm in Catalonia and said it would cull 17,000 ducks. In 2015 Russia had stopped the movement of US poultry through the country in an effort to halt re-importation. 157 cases of bird flu were found in 17 Russian states which resulted in the slaughtering of 33.3 million chickens. Russian Agricultural watchdog Rosselkhoznadzor found “harmful residues and illegal substances,” including antibiotics, in the products. “This decision was made due to the fact that the US is at the centre of a bird flu infection and we have seen facts of American transit products returning to our market,” the head of Rosselkhoznadzor Sergey Dankvert told Interfax. Now Rosselkhoznadzor is about to ban import of poultry from several EU countries as well where outbreaks were registered. The Saudi Food and Drug Authority (SFDA) recently banned poultry products from 6 countries. Dozens of countries have imposed total or partial bans on U.S. poultry and poultry imports since the outbreak of this highly pathogenic avian influenza (HPAI) was discovered. 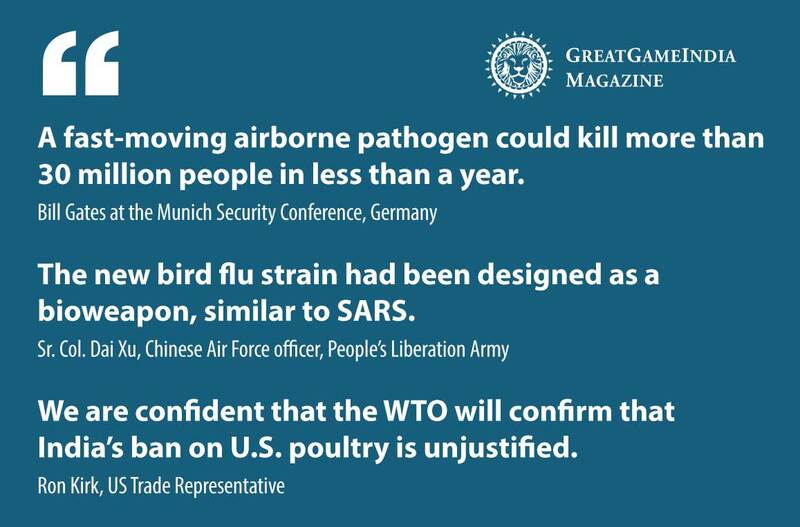 The threat posed by this deadly avian flu and how a WTO ruling puts India at grave risk of a deadly pandemic was reported by GreatGameIndia six months back in August. To prevent the disease from entering into the Indian market India had already banned the import of frozen chicken legs from the U.S. to stop the spread of this deadly avian influenza. However US raised a dispute with the WTO. A separate statement from US Agriculture Secretary Tom Vilsack claimed that the United States had repeatedly sought scientific evidence for the import restrictions. 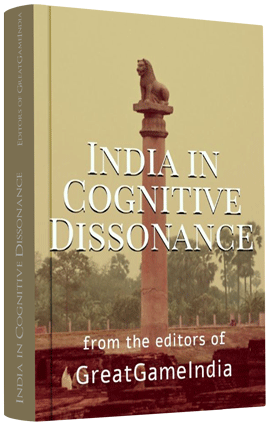 A WTO panel confirmed in June 2015 an earlier ruling that India’s ban was not based on international scientific standards, was more trade restrictive than necessary, and unfairly discriminated against U.S. imports. India was given until June 2016 to lift the ban and follow international standards. Along with it India was to be slapped with a penalty of $450 million per year for failing to comply with a World Trade Organization ruling. The concerns of the Rs 50,000 crore Indian poultry industry regarding chicken raised on genetically modified (GM) corn and soya as feed being dumped on the Indian market have since fallen on deaf ears with no action from the Indian Government. Excerpt from GreatGameIndia’s report – Is The Disease That Resulted In Death Of 50 Million Birds, 8444 Job Losses And $3.3 Billion Loss To US Economy, Coming Soon To India? While countries around the world are trying to prevent this now mutated deadly avian flu outbreak into their human population through ban on poultry imports from certain countries, the Indian Government seem to have negotiated an agreement with US officials during the Strategic and Commercial Dialogue in New Delhi last year. Even though reports of bird flu cases are pouring in from different parts of the country substantial steps are yet to be taken by the govt to contain the outbreak. Like India, China is facing the largest pandemic threat to hit the country in the last 100 years accounting for the deaths of 79 people in January from the 192 human cases reported so far. Until it was detected in China in March 2013, the virus hadn’t been seen in people or animals, apart from birds. At the time Sr. Col. Dai Xu a Chinese Air Force officer of the People’s Liberation Army accused the U.S. government of creating the new strain of bird flu afflicting China as a biological warfare attack. Dai alleged the new bird flu strain had been designed as a bioweapon, similar to severe acute respiratory syndrome (SARS), that affected the country in 2003 which was also developed as a US bio-weapon. In 2011 it was revealed that the U.S. government paid scientists to figure out how the deadly bird flu virus might mutate to become a bigger threat to people — and two labs succeeded in creating new strains that are easier to spread. The details of the study were not published until in 2014 when Ron Fouchier and his team at Erasmus Medical Center took the H5N1 flu virus and made it more contagious. Now the team has published another study with more details on the exact genetic changes needed to do the trick. Critics argued that the scientists had created a dangerous new superflu. The security versus scientific openness debate is a long drawn out battle. The question is where does India stand? Before addressing the issues of science and security first India need to settle the question of international trade arbitration and the political will to do it. India with the population of one billion has high chances of rapid transmission of such virus – Ebola or Swine Flu or any other deadly virus once it hits the crowded metropolitan cities of India. Is India prepared to tackle a weaponized attack of such viruses? How would we know if it could be classified as a naturally occurring phenomenon or a biological attack? What should be our counter response if it were found to be an attack? Does India have a National Security policy that deals with such a scenario?